Our CEQ Earthquake Certification Course is designed to help you satisfy California’s Title 10 training requirements. To earn your CEQ California Earthquake Certificate, you must read our entire course book (online or in book form), pass an open book exam and comply with all regulations outlined throughout the course. upon completion of the course, you will automatically receive your CEQ Certificate online or through our website. You must retain your CEQ California Earthquake Certificate for a period of five (5) years. California’s Title 10 requires earthquake re-certification every three years, i.e., to keep your training active you must repeat this course every three years. To adjust CEA (California Earthquake Authority) claims, you must ALSO take training through the CEA. To keep your CEA approval active requires on-going “detailed training on CEA Coverages and the CEA Claims Manual every three years or within one year after a revised version of the CEA Claims Manual.” CEA online training must be completed PRIPR to the adjuster being dispatched to handle any CEA claim. 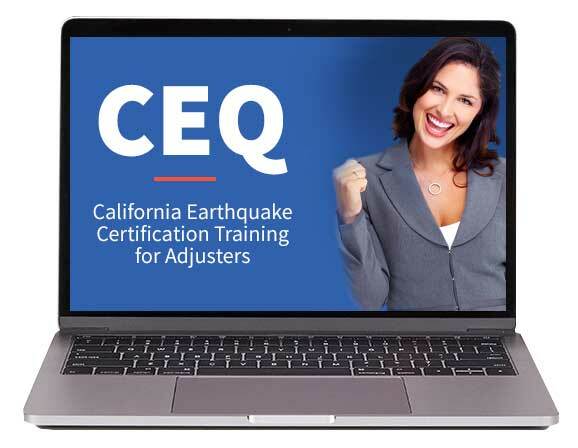 NOTE: Our CEQ California Adjuster Earthquake Course certifies you to handle ISO earthquake claims in California. Start here. NOTE: The CEA requires additional online training to adjust CEA specific policies. CEA training can be accessed here. Ready to start your online CEQ Earthquake Training?